Turmoil, turmoil and more turmoil; the world is a very volatile place right now. When you turn on the news or the radio and hear about all the difficulties going on in Libya, Egypt, etc; you have to feel more grateful than ever to be living in a country that strives to protect the rights and freedoms of all its individual citizens. While we are far from being a perfect society, you have to appreciate the foundation on which our great country was built. Set up many years ago by some very wise men in the most sacred of documents, the Declaration of Independence. To help celebrate this all important collaboration of our forefathers, Visconti has created the limited edition Declaration of Independence 1776 fountain and rollerball pens. The Visconti Declaration of Independence 1776 Pens are incredible. The barrels, through Visconti’s unique scrimshaw technique,are a replication of the full text of the Declaration of Independence and includes the many important signatures of the remarkable men responsible for drafting this priceless document. With aged sterling silver trim, a cap engraved with the American eagle (the symbol of our coveted freedom) and one of the coolest features, the mechanism of the plunger, operated by the Liberty Bell (an iconic symbol of American Independence); these pens are a great tribute to the cornerstone of our great nation, the Declaration of Independence. Beautifully packaged, these pens would make an extraordinary gift for a public servant who has the privilege of protecting and interpreting the ideology behind this important historic document; or for that matter, all American citizens who can appreciate how critically important the Declaration of Independence was in the forming and sustaining of the United States of America today. The Visconti Declaration of Independence fountain pen and rollerball pen, check them out today and start honoring and appreciating the many great freedoms we are afforded, “Life, Liberty and the pursuit of Happiness”, in this precarious world we live in! Now available at Executive Essentials! Vincent Van Gogh was one of the greatest Dutch post-impressionist painters of his time with an influence that reached far into the 20th century. Born into a wealthy family in the Netherlands, Van Gogh grew up in a religious family where he received both homeschooling as well as a Catholic School education. He was a serious and quiet child who’s love of art blossomed at an early age. It would be this love of art and of the Impressionist painters of his time that would drive him to his physical and mental limits in becoming a master of his medium. 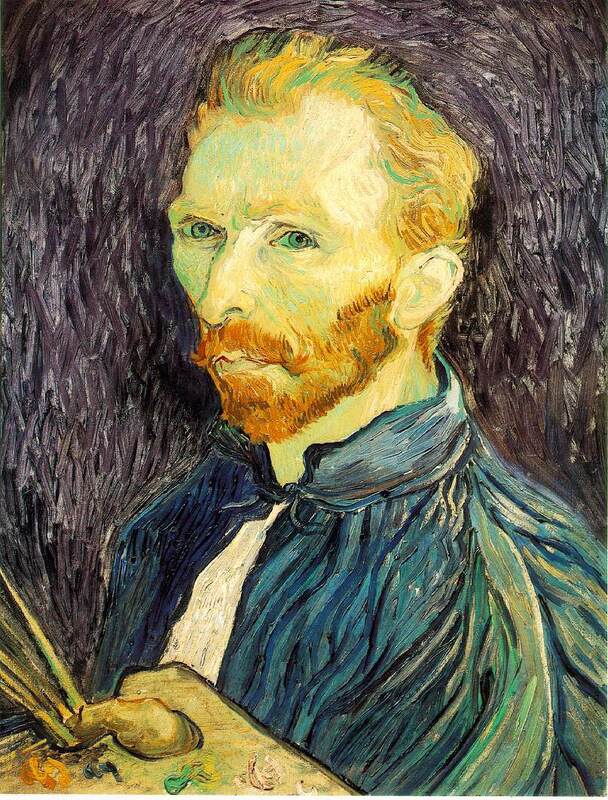 In his early adulthood, Vincent became an art dealer, just like his longtime friend and brother, Theo Van Gogh. This was a profession that he was very good at. Soon he was making a great deal of money. But, he became discouraged by the way art was treated as little more than an object of wealth. This coupled with relationship problems lead into a bout of depression and eventually, he lost his job as his depression and hatred for dealing art began to show to his clients and employer. Shortly after losing his job, his family convinced him to move to England. During this time, Van Gogh begins to experiment more consciously in his drawings. He begins to weave his expressions into his landscapes and forges a new style filled with somber palettes and rough strokes. His art never slows and his penchant for capturing the essence of daily life in both his portraits and still life begins to take on an atmosphere of their own. His true climactic work comes later in his life were his post-impressionist expressions truly shine. It is from these later years of his life that Visconti Pens draws from in order to pay tribute to Vincent Van Gogh. The original Visconti Van Gogh collection enjoyed a decade of followers from around the world. Now, Visconti is ready to provide further inspiration and innovation by creating writing instruments inspired by the artist’s color and technique and his emotion captured in some of his individual paintings themselves. Visconti has worked hard to formulate palettes of color that accurately reflect the technique and emotion of each of Van Gogh’s paintings like the Starry Night (fountain pen) and the Sunflowers (rollerball pen). Never before have pens been created that were inspired from a specific canvas, like the Room In Arles Eco Roller. But, through the meticulous and painstaking choice of color and palette mix, each Visconti pen has emerged to capture the spirit and verve of each specific Van Gogh painting. Take a look at all the pens in the Visconti Van Gogh Collection and see for yourself why Van Gogh is such a treasure for all time. Fountain Pen Basics are posts for new fountain pen users who are learning the ropes. The series will introduce you to fountain pen terminology by looking at solutions to common fountain pen problems. In this week’s entry, we will be investigating pen materials. Previous entries in this series have covered new pen clogs, feathering and skipping. I often talk to new pen owners, and people who are thinking about buying luxury pens. One of the recurring questions is: “what are expensive pens actually made from?” The common misconception is that expensive pens are made from expensive materials, like precious metals (gold, silver, platinum) or hard-to-work metals (titanium). In fact, most luxury pens are made from what seems like fairly common materials, like plastics and resins. The reason why these pens are expensive is that these materials are machined to make a well-balanced and beautiful writing instrument. For this week’s installation of Fountain Pen Basics, I will explain the different types of barrel materials that can be found on modern pens. The barrel is the main body of the pen. In ballpoints and rollerballs, it is part of the pen that holds the pen refill. 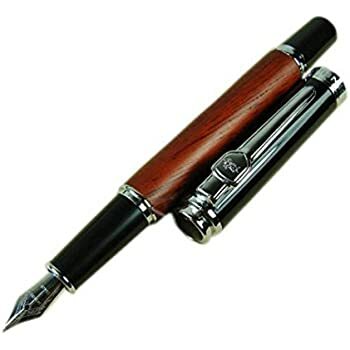 In eco-rollers and fountain pens, the barrel holds the ink reservoir, filling mechanism, and writing assembly. When looking at a pen, the barrel is usually the first thing that strikes your eye. The color, the texture, the way the light strikes the material. The barrel sets the tone for the entire aesthetic experience of the pen. But the barrel is important for more than just how pleasing a pen looks; the barrel’s material also determines how light or heavy a pen will be, and what it feels like in your hand. Behind the scenes–before you ever buy the pen–the material of the barrel determines how elaborately the pen can be shaped, and how it will perform under long-term ownership. There is a wide range of materials used in modern pens. The majority of these materials fall into three categories: non-precious metals, precious metals, and resins. Some other less-seen materials, like ebonite and titanium, are still seen occasionally from pen makers like Delta and Visconti and are most often found in limited edition pens. The most common non-precious metals used in luxury pen are chrome and brass. In many modern pens, chrome appears most prominently as trim or appointments. On ballpoints, the screw-on cap near the pen tip is a small chrome section. However, chrome is sometimes used as a barrel material. The use of chrome is limited by the fact that not much can be done with it color-wise. Cross has used chrome in the past for its “chrome” or “silver” colored pens. Brass is a much more common barrel material because of its heft. There are multiple ways in which brass can be incorporated into pens, but the two most common are: a brass base is directly lacquered or painted, or a brass core is tightly glued to a thin layer of something else. In each case, the brass lends a barrel a “weightier” feel. Waterman uses a lacquered brass base for the Carene. It is very uncommon to find solid barrels made from precious metals. Gold and sterling silver in modern terms don’t make for good barrels. The metals are highly slippery, and to modern aesthetics, not as deeply colored as resins or lacquers. 22k and 18k gold are both fairly malleable, and not well-suited to the barrel that must stand up to wear & tear. Though precious metals have long been used in the appointments on high-end pens, over the years, other metals like steel, chrome (or even metal-colored plastics) have replaced precious metals on many “entry-level” models. However, gold and silver still can be found on filigree-style pens, usually over a base of other metals or resin. These pens are often limited editions, like the Stipula Galileo Skeleton (Limited Edition). What should be watched out for when purchasing a pen with gold or sterling silver in the barrel is a check on what kind of metal the pen uses. (And whether the purity matches your expectations). Gold plating, gold vermeil and gold-rolled are the three most common types of “impure” gold found on pens. Gold plating is often very thin and can wear off. Gold vermeil and gold-rolled items have a thicker coating of gold and are often worth more in purely practical terms. The most complicated category for pen materials is resins. The term resin is widely misunderstood. Resins are liquids that are insoluble in water. Natural resins derived from tree or plant sources. Synthetic resins are long-chain polymers derived from petroleum and are often called plastics because of their malleability during the manufacturing process. There is a middle class of polymers that have plant derivatives (cellulose) that have been treated with acids and mixed with camphor. One such patented resin is known as celluloid. When resin became a selling term for high-end pens, the term picked up a host of position connotations and became distanced from its actual definition. On pen pages, you will often see a luxury pen touted as having a barrel made of a “high-end Italian resin” or simply “resin”. Cheaper pens are described as having barrels made of “plastics”. Both of these pens use a synthetic resin. So what sets them apart? Is there a difference between them? There is in fact quite a big difference between them. In this next section, I will use the word “acrylic”. “Acrylics” is another term for a synthetic resin. I will use “acrylics” in this section to talk about the different types and qualities of pen-grade “resins” and “plastics” to avoid confusion between the chemical terms and the publicity terms. Injection-molded acrylics (e.g. “plastic”) are molded and shaped. These are more commonly known as plastics. Chemical names are Acrylonitrile Butadiene Styrene and polyethylene–rarely noted by a pen seller. The main thing to know about these materials is that they are hard, and can be molded into complicated, modern shapes. Pens like the Pelikano and the Lamy Safari are plastics that have been molded into fairly unique barrel shapes that have pen grips.When resin became a selling term for high-end pens, the term picked up a host of position connotations and became distanced from its actual definition. On pen pages, you will often see a luxury pen touted as having a barrel made of a “high-end Italian resin” or simply “resin”. Cheaper pens are described as having barrels made of “plastics”. Both of these pens use a synthetic resin. So what sets them apart? Is there a difference between them? There is in fact quite a big difference between them. In this next section, I will use the word “acrylic”. “Acrylics” is another term for a synthetic resin. I will use “acrylics” in this section to talk about the different types and qualities of pen-grade “resins” and “plastics” to avoid confusion between the chemical terms and the publicity terms. Machined acrylics (e.g. “resins”) are acrylics that have been either custom-made or purchased in stock sheets or rolls that are then worked on a machine. On a machine, acrylics can be smoothed, polished, layered–anything that a natural material like wood or stone could be worked. Because these acrylics are shaped by hand, they must be shaped into fairly standard barrel staples. However, they are often gorgeous and deeply colored. Though “Italian resins” is often used as a selling point, it has a lot of truth behind it. Italian pen companies like Delta, Stipula, and Visconti have created beautiful pens with deeply colored resins. Visconti’s Impressionist collection recreates the color of Van Gogh’s paintings. Delta’s entry-level Markiaro Posillipo has rich, shifting layers of color. Compression molding acrylics are acrylics that look like there are shimmering chips or stone pieces inside of the resin. Of all of the types of acrylics, this type is under a lot of internal pressure. Due to this internal pressure, compression molded acrylics are known to crack. Though beautiful, due to their shimmering and varied colors, pens with these kinds of acrylics in their barrel should be handled carefully. The Conklin Endura is an example of compression-molding. Lithographed acrylics is sheets or rolls of solid color that are lithographed with a pattern. Although “plastics” generally get a bad rap, lithographed acrylic are generally the cheapest-looking acrylics. The reason is that while they attempt to look marbled or multi-colored, all pens in a particular lithographic printing have the same pattern–and this pattern often attempts to look like machined acrylics (resins). It’s a fairly cheap-looking effect and has declined in popularity in recent years. Red is the color of rubies, strawberries, and blood. It is a color that is at times associated with anger and other times associated with love. It conjures up images of passion, danger seduction, while at the same time being the chosen color of communism and socialism. It’s one of the prime colors in Christmas and a big part of Imperial China. Red is everywhere. Red means many things. In the ancient world, you can find evidence of past cultures written on the walls of caves on the coast of South Africa. These markings and drawings are formed with ink derived from red clay, colored so by the presence of iron oxide. But, red didn’t only come from the minerals of the earth. Other early peoples crushed native berries to create a reddish colored ink to sketch the history of their existence. A practice that repeated throughout the ages. Red was the third color to ever have a name – after white and black. It is one of the three primary colors along with blue and yellow. When mixed with yellow you get orange and when mixed with blue, red becomes violet. When white sunlight is scattered by air molecules and the shorter beams are left out, it produces a red sunrise or sunset, a reminder that light is a culmination of all colors and darkness the absence of all. Red means many things to many people and in the world of pens, there are many opportunities to own a pen with this vibrant, lively color. Any pen, given this distinctive, attractive color instantly takes on a characteristic of its own. It inherits a dangerous property or becomes a token of love and affection. Red is clearly a color of importance and these are just a few of the important pens that bear its hue. Small and handy, the Lamy Pico Pocket Pen is a writing instrument for all occasions. Encased in metal from head to toe, this roundish device attracts attention in any color but deserves a special mention in red. The perfect travel pen for those on the go that want to make a statement. Italian craftsmanship is known around the world for many products from fast cars to reliable kitchen appliances. In the world of pens there are many manufacturers, but none so surprising as Delta and their Fusion One series. The well built, handsome fountain pen has simple lines that call out a modern exterior. The modest silver bands are polished to a bright sheen and of course, the whole pen is swelling in a cherry red hue. The body of this pen is hand turned from solid bars of Italian resin and polished to a sheen. A handful of refined pleasure, waiting for your words. Inspired by one of the world’s greatest painters, Rembrandt Van Rijn, Visconti created this elegant writing instrument, meant to invoke the nature of Van Rijn’s work. Just as Van Rijn used multiple layers of different hues of the same color to give his subjects depth, so did Visconti use multiple layers of red resin to give this magnificent pen a depth and character that beams in red. The smooth nature of this barrel in contrast with the wide arching clip give the pen a modern, yet classic look. A perfect pen to make a statement with at any event or occasion. These are just three of the great red pens available at Executive Essentials. To learn more about these and other colorful pens, visit and browse our online catalog. In the surrealist painting, The Persistence of Memory, a bleak landscape is laid out before the viewer, nearly fading into the background in a haze of brightness. In the foreground, several, larger than life pocket watches drape over tables edge the branch of a tree. One is melting on the ground. They look soft, pliable and perhaps a bit lazy. It gives the picture a feeling of heat and exhaustion. It’s unexplainable, yet intriguing enough to give those new to it, a reason to pause and to think. A reason to stop and wonder what meaning, if any, the picture may be trying to impose. The inviting thought was one of the goals of Salvador Dali, the creator of The Persistence of Memory and many other surrealist paintings. Born in Figueres, Spain in 1904, Dali was a skilled draftsman who created striking images that invoked into the mind images that most only saw in dreams. His skills drew from the techniques and visions of the Renaissance masters, but with a twist all his own. Much of what made Dali exciting was his penchant for science, mathematics, and experimentation. His art grew from a love of science and the mysteries that it contained. His thoughts revolved around the world and how it worked and how it was perceived. He delighted in optical illusions, negative space and visual puns. His artwork in the 50’s showed this love best in his use of logarithmic spirals, divine geometry, and other high ideas. He was enthralled by the idea of a tesseract, a 4-dimensional cube. 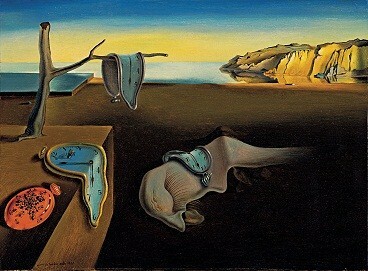 Dali died in the late 1980’s after a life lived to extremes. His last painting was for King Jaun Carlos of Spain. The piece was called Head of Europa and it was Dali’s last painting before he died listening to a recording of Tristan and Isolde. He was buried in Figueres, Spain where he was born. To commemorate the life and times of this extraordinary artist, Visconti has produced the Dali Dance of Time Limited Edition Fountain Pen. The pen was created by Benjamin Levi, a close friend and collector of Dali’s sculpture work. 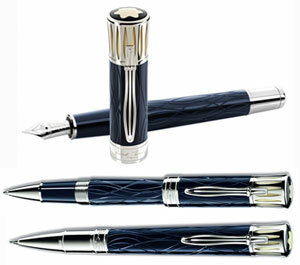 Limited to 904 pieces, the pen uses the exclusive Visconti 23 K Dreamtouch palladium nib. The wide cap band has Salvador Dali’s signature engraved across it and two open windows on the cap all you to see the pen interior. Time and our irrational fixation with how it moves are depicted on the pen with the now famous melting pocket watch, which covers nearly half the barrel. There is also a bleeding heart on the pen barrel taken from Dali’s “Unicorn” sculpture. The entire piece is crafted into one, comfortable pen through the use of soft and hard curves, giving the pen a sense of life. To flesh out the entire package, Visconti craeted a pen stand that replicates, The Profile of Time, a sculpture of a melting watch on a tree. The entire limited edition pen package is a sight to behold and soon to become of favorite of pen collectors and Dali lovers alike. So head on over to the Executive Essentials online catalog and take a look at this and other Visconti pens. Father’s day is coming up and nothing says, “thanks Dad”, like a fine writing instrument.